I admit it. I’m one of the people that has put a big emotional investment on hope. I think everyone hopes for something, but the extent to which we rely on that hope, and and to which it makes us happy or sad, anxious or angry, motivated or despondent, varies. In this particular case, my hope has led me to inclinations of the latter of each of the three pairings (sadness, anger, despondency). Why? Because I’m not hoping for something that hasn’t been discovered yet (well, I am, but that’s not what upsets me). I’m hoping for something that is available to the most of the free world (you can even order it in Canada, apparently), but not in the United States. 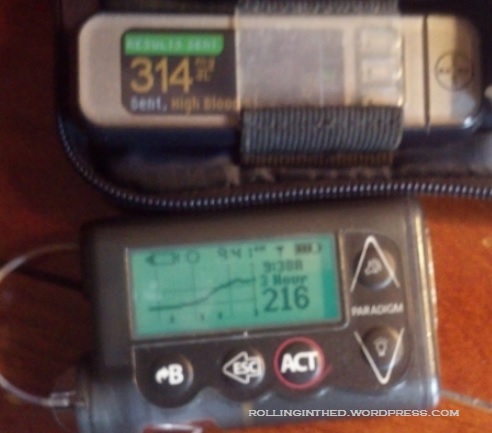 I’m talking about the Medtronic Enlite Continuous Glucose Monitoring Sensor. Yes, it was my mistake. But I should have been alerted that this was more than just a typical morning after-breakfast postprandial rise. Numbers in the 200s make me expect it will come back down. Numbers in the 300s make me think something’s wrong. Thank you, FDA, for forcing me to live in the past. Though the CGM is neither food nor drug, this bureaucratic government agency has its paws all over it, and is shifting the United States from a progressive country to a regressive one. I have a pretty good idea on what the first initial in that agency’s name really stands for. It pisses me the hell off. I’m not mad at Medtronic for this 98-point discrepancy. The sensor that I use (the one with the picture of the woman eating carrot cake on the box) is obsolete. Everyone knows it, and that’s why they won’t sell it to most of the civilized world anymore. What’s holding up the process? This is an enhancement to an existing product, not a novel idea. It’s not “disruptive technology”, meaning it won’t change the way we do things. It’s not a drug, and it doesn’t administer a drug. In fact, it doesn’t do anything that anything else hasn’t done before. It simply does it a little bit more accurately. In fact, other companies (see Dexcom) are already doing it. When the FDA approved the Dexcom G4 Platinum, the Tandem t:slim, and the new Insulet Omnipod, I got my hopes up. I figured the FDA has finally gotten around to addressing diabetes technology. Finally. As Omnipodders, Dexcommers, and Touchscreeners rejoiced, I figured my time would be coming soon. I heard some really encouraging things from people who seemed to have more knowledge of the situation than I do; although I have no way of checking their credibility. I’ve also heard just the opposite. I won’t get into specifics because, like I said, I can’t confirm any of it. But when you hear these things, it’s hard not to get excited. Even if there is no verifiable reason to do so. It’s easier to believe that a product which has been on the market for a couple of years already would finally expand into, perhaps, the largest market in the world. It’s hard to believe that wouldn’t happen. But then, there’s that damn regulatory agency. That g-damn FDA. I’ve thought of going with the Dex. Given some really serious thought to asking to borrow an old Seven+ from someone whose upgraded to the Platinum. I still consider it sometimes. But summer’s coming, which means the jackets come off and pockets are at a premium. Where would I put the separate receiver? What if I lose it (I could be angrier than an angry Bigfoot). And do I really want to manually input my BG readings for calibrations, and would I miss the predictive alerts and different Hi-Low targets between day and night? Would I miss the back-filling of data if I’m out of range for a short-time? My integrated CareLink reports, which I love almost as much as life itself, would be lacking. How well could I analyze such fragmented data? How would my endo feel about putting the pieces together? Should I really care how my endo feels? With my luck, the day after I get a Dexcom would be the day the Enlite comes out. Medtronic already released the Guardian, their first pump with built-in CGM within a week or so of me getting my first pump. The pattern could repeat itself. Maybe it’s the FDA being overly cautious. In the wake of the recent OneTouch Verio recall, they’re probably even more-so, which is unfortunate. I’d bet they’re patting themselves on the back because the one “serious adverse event” that happened with the meter happened overseas, with a model that didn’t hit the shelves in the States. Never mind that this serious event happened because somebody’s blood-sugar was higher than stratospheric levels. A bit irrational? Perhaps I am getting irrational. But that comes with getting angry and emotional, and right now I’ve got plenty of anger right now. It exists. It’s proven. It works. Just let me have it. Posted on April 23, 2013, in Continuous Glucose Monitor (CGM), Diabetes, Personal and tagged emotion, fda. Bookmark the permalink. 10 Comments. oh, my eyes! the gory link should come with an NC-17 rating! i bet your thing will be approved soon. it’ll be a race between that and the animas vibe—or whatever they call the US version of the Ping with integrated Dexcom G4 Platinum. Oh Scott I am with you on this one! I’ve had the Paradigm/Sensor combo system for 4 years now, but only in the last year have I started wearing my sensor all the time. It’s such a PITA to change the site and the discrepencies from my meter can be bad at times (though sometimes they are right on, too). My pump warranty was up in February, so I am hoping to hold on for the new system to be approved before locking into a new pump. Here’s hoping nothing goes wrong before then! I’m anxiously awaiting it as well. I think I have a serious crush on the CareLink reports (or maybe more accurately, my docs ability to interpret and make adjustments), but I couldn’t wear the old sensor. Sad to hear no new news on when the Enlite will be approved. Although I switched to Dex G4 in February because I couldn’t wait any longer for Medtronic, or I guess for the FDA to get their act together. I’m very happy with the switch, but I do miss those CareLink reports! I’ve been keeping my eye out for it, but also watching the clock. Just yesterday I placed an order for a 2-month refill on the SofSensors (rather than the normal three). My insurance changes on July 1 and I don’t know what kind of coverage I’ll have then, so this way, I can be assured of getting another shipment of sensors — whichever ones they may be — before that date comes. Silly, silly, D-games. I hear you on every stinking level here. SERIOUSLY! and think about this, Canada is even further behind than the States! It’s not going to kill us, it’s going to make our lives marginally better.